We’re looking at coaxial cable, which is the backbone of any TV distribution system whether it comes from an antenna or a satellite. Because cabling problems are the hardest to diagnose, using good cable will always pay off in the end. But why overspend? 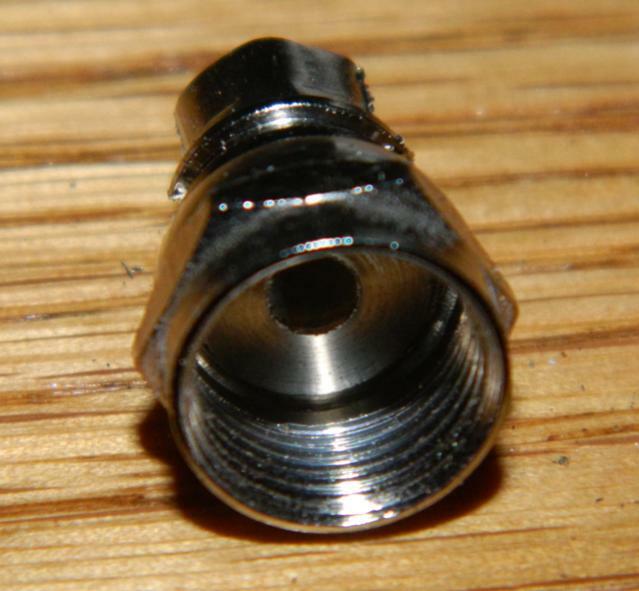 A coaxial cable has four parts: the core, the dielectric, the shield, and the jacket. A coaxial cable is the perfect cable for carrying audio and video for several reasons. The central wire is part of the connector itself, so there is less loss when connecting. The dielectric (the white part) when combined with the metal shield, keeps all the good signal in and keeps the bad signal out. The outer jacket can be made thick and weatherproof. I began this test of my 99 cent Uninex Coaxial Cable by using the cable for what it was designed for. I connected it between a DIRECTV splitter and a DIRECTV receiver. I bought this cable at a store called “99¢ Only” so my expectations were not that high. The Uninex Cable connected to the splitter. I ran into problems right away. 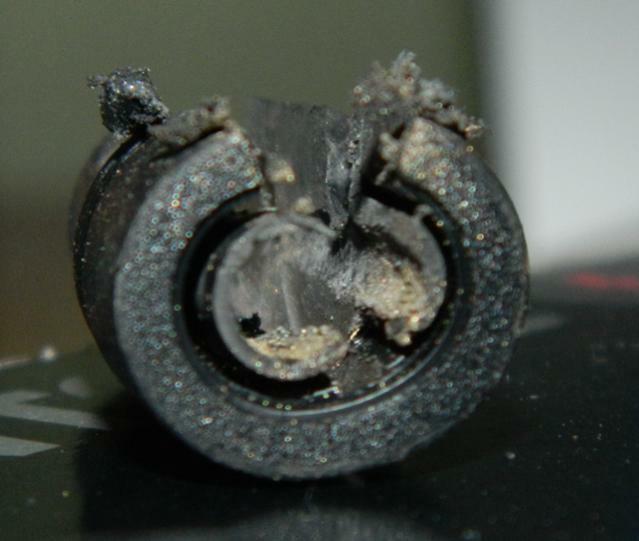 The hexagonal part of the connector is only 2mm wide, so I had to push the rubber insulation all the way back in order to get a good connection. The connection never felt tight but it was beginning to feel like I was spinning the whole connector, not just the part that was supposed to spin. This message generally means bad wiring somewhere. I don’t have to go very far to figure that out. It’s possible the cable just broke. There goes $1 well spent, right? Let’s take a closer look at this miracle of modern technology. After disconnecting the bad wire and putting the good one back, the problem goes away. No surprise there. I take the cable out to the workbench to cut it apart. Let’s see what it looks like. Ten seconds with a Dremel and this thing pretty much falls apart. The plastic shroud is glued on and it peels off easily. 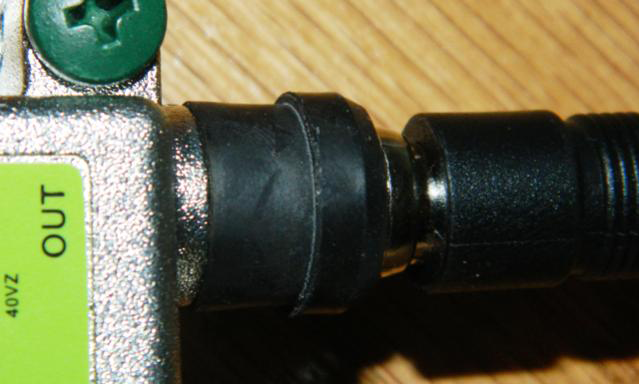 From the look of the picture below, the connector was put in between two layers of plastic and glued in. There is a slight hex crimp on the connector but it may have been molded that way. There are no stress points or scratches where a crimping tool would have been used. The entire connector has a very tinny feel to it and it fell apart shortly after I took the second picture. Looking at the cable with the shroud and connector removed, it’s pretty weak. 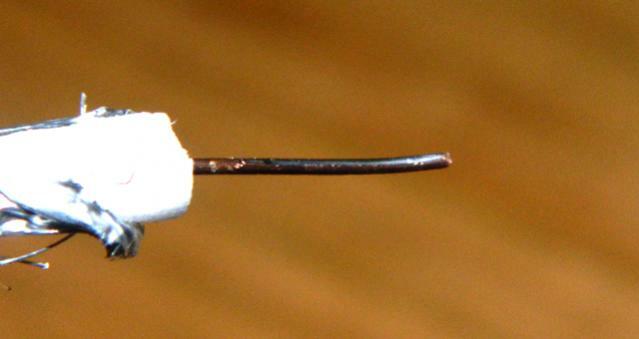 There are a few strands of a silver-colored metal surrounding a very thin foil layer that breaks easily. Inside of that is the dielectric layer, which provides all the insulation for the cable. It seems to be the same kind of white foam usually seen in these cables but it is only between 2 and 3mm thick. The core carries all the signal and in general these are solid copper for the best possible performance. I know copper is expensive so I’m not surprised when I can take a utility knife and scrape the copper off the sheath revealing a cheaper metal. The copper is so thin that I’m sure it would scrape off with just two or three connection/disconnection cycles. It’s pretty bad when a 99 cent cable isn’t worth what I paid for it. This cable didn’t hold up for five minutes and I was very, very careful. It was flimsy, difficult to connect, and fell apart quickly with the slightest stress. It didn’t hold up to any testing at all. Even if I had nothing else, I’m not sure I would use this cable. Maybe if I needed to pull my old VCR out of the garage and hook it up to an old-school tube TV… and then it probably still wouldn’t work. I would not recommend going to your local 99¢ store and picking up a cable to run your satellite system. It just seems like a bad idea.